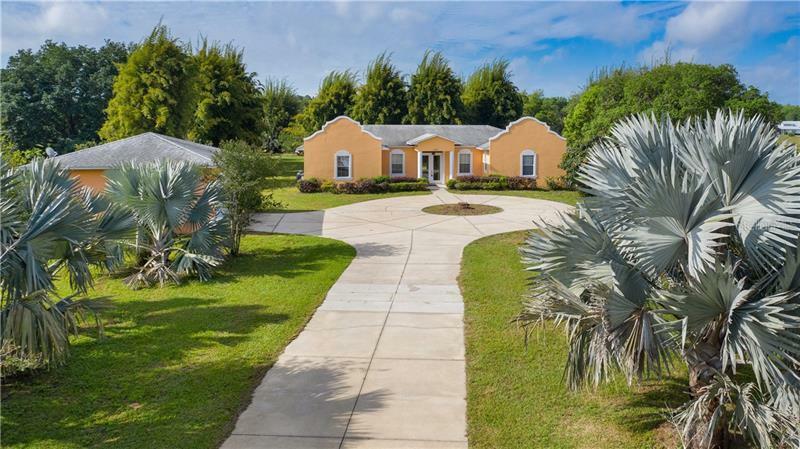 Custom built Spanish style 3/3.5 home on almost 2 acres in the Greengrove Estates gated Community in Clermont! Gorgeous landscaping surrounds this home as you enter the circular driveway. Upon entering the home you'll see there is plenty of natural light and beautiful garden views from almost every room in the home. The construction of the home includes solid poured concrete frame and foundation double pane aluminum windows granite counter tops in kitchen and bathrooms porcelain tile throughout the home and all the bedrooms feature en-suite bathrooms. The Kitchen has gorgeous dark cherry cabinets stainless steel appliances and great views of the backyard. The backyard features a 5000 gallon koi pond and huge paver patio that is great for entertaining. There's a deck and walkway that leads to a small pond that is great for relaxing. It is secluded and quiet yet not far from town. Come check it out!